ABUJA, Nigeria, Feb 8 2018 (IPS) - The 2018 Humanitarian Response Plan (HRP) for north-east Nigeria demonstrates the commitment of the international community to the people of Nigeria. It is also a clear and positive indication of the strong and continued partnership between us – the international humanitarian community – and the Government of Nigeria. As we know, the humanitarian crisis in Nigeria’s north-east, that has spilled over into the Lake Chad region, is one of the most severe in the world today. It is also now in its ninth year. This crisis is a protection crisis first and foremost that has also evolved into a food security and nutrition crisis. 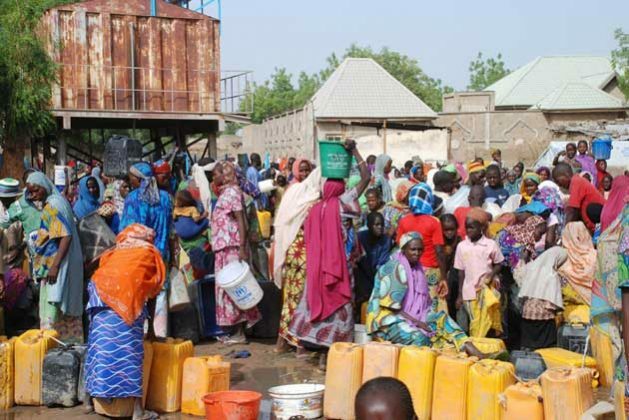 7.7 million people are in need of humanitarian assistance this year in the worst-affected states of Borno, Adamawa and Yobe. These are people who have been displaced and are living in camps or host communities, people who have returned home to nothing, and people living in other areas that are hard to reach for humanitarians. 6.1 million of these people are being targeted for humanitarian assistance in the 2018 Humanitarian Response Plan by 60 organisations, including UN agencies and international and national NGOs. This humanitarian assistance ranges from food, protection, water, shelter and sanitation, to medicine, education and agricultural support, and will be delivered to vulnerable women, children and men across the three states. These figures, and those that you find in the documents, have been arrived at after meticulous and thorough consultation with all humanitarian partners, including the Government of Nigeria. The aim in 2018 is to build on the humanitarian work carried out in previous years and we have three strategic objectives. The first is to provide life-saving emergency assistance to the most vulnerable people in conflict-affected areas, ensuring that assistance is timely and to-scale. The second is to ensure that all assistance promotes the protection, safety and dignity of affected people, and is provided equitably to women, girls, men and boys. The third is to help people kick-start their lives again and also reconstruct the foundations of their lives so that they are better prepared to face future crises. This includes the 1.3 million people who have returned home, but also includes those who have decided to stay where they are and try and rebuild their lives. While nothing should undermine the commitment to principled humanitarian action, there is a shared moral imperative to sustainably reduce people’s dependence on humanitarian aid and support self-reliance. This year, we, a community of 60 organisations working to implement the HRP, will aim to provide food assistance, including through improved agriculture, to 3.7 million people. Because grave violations of human rights continue to take place daily, we aim to support 2.7 million vulnerable women, children and men with protection services. Medical care is also a priority and will be provided to 5.1 million people. Many children and pregnant and nursing women are malnourished as a result of the crisis, and nutritional supplements and support will be given to 2.7 million of them. In many locations, access to safe drinking water and adequate sanitation facilities remains a big problem: we will aim to support 2.7 million people in need of those basic services. We will provide shelter and basic household items to 1.3 million persons living in camps or host communities. About 2.2 million children and teachers will be supported through education assistance, including through the provision of safe spaces for learning, school supplies and teacher trainings. Finally, for longer-term impact, 2.7 million people will be supported in accessing basic public services and restarting their lives. And all of the above interventions will be guided, every day, by the humanitarian principles of humanity, neutrality, impartiality and independence. Last year, the humanitarian community provided life-saving assistance to 5.6 million people. Several successes were achieved. Notably, the number of food insecure people was reduced from 5.1 million to 3.9 million. A cholera outbreak was contained through the innovative use of an oral cholera vaccine. 1.3 million farmers were assisted to help improve agricultural production. And thousands of children were supported to go to school, against all odds. These results – which are just examples of the many positive results that I have myself witnessed in many areas of the north-east – can be attributed to strong coordination, extensive engagement and generous funding. Despite these achievements, many challenges remain as the conflict and population movements continue. Prior to the crisis, the region was already mired by chronic development challenges. Humanitarian assistance has stopped people from slipping further below emergency thresholds, but it has not addressed underlying vulnerabilities and problems. In the absence of a political solution, the crisis will continue through 2018. While a robust and improved humanitarian response will be essential – especially in hardest-hit Borno State – the protracted nature of the crisis creates new needs which require longer-term assistance. For the 1.6 million who are displaced from their homes, and the communities that host them, we need to find durable solutions. This requires longer planning horizons, more strategic interventions and flexible, longer-term funding. The 2018 HRP is, therefore, underpinned by a multi-year strategy that demonstrates a commitment by the international humanitarian community to align with the Economic Recovery and Growth Plan, the Buhari Plan and the United Nations Sustainable Development Partnership Framework. It is a step towards strengthening the humanitarian, development and peace nexus, in line with the New Way of Working and commitments made at the World Humanitarian Summit in May 2016. Capacity building for local partners and government counterparts will also be prioritized to strengthen national response mechanisms. We aim to promote what we call localization of the response, which means investing in the institutional capacities of local and national responders, including national NGOs and local government. Gender-sensitive programming will also be strengthened. Finally, we remain accountable at all times to the people we serve and we will be making a concerted effort throughout the year to systematically communicate with and listen to the communities. Access to target populations is obviously a pivotal part of the implementation of the Humanitarian Response Plan this year, as 930,000 people are estimated to be in areas that are hard to reach for humanitarian organisations due to insecurity or the threat of insecurity. We will be working this year to advocate for improved access, and we are also aiming to obtain safety assurances for the delivery of aid in hard-to-reach areas. In 2017, donors funded the plan very generously. The $1 billion appeal was 70 per cent funded by the end of the year – representing more than $740 million, a staggering amount that actually meant that Nigeria was one of the best funded appeals globally. The donor commitment was extraordinarily impressive, and one of the most remarkable I have seen in my career. The total donated to the humanitarian response last year, including HRP and non-HRP interventions, reached $945 million. We have also committed this year to including any carry-over from last year, so as to be entirely transparent when it comes to funding. The carry-over from the 2017 HRP to the 2018 HRP will be an estimated $196 million. This means that this sum has already effectively been raised and allocated to the 2018 HRP. We estimate however that most of the carry-over will be exhausted in the first quarter of the year, and I call upon donor representatives to start pledging resources to the 2018 HRP. While we are aware that other large-scale crises also require donor attention, it is essential to continue this positive momentum and build on the results we achieved last year. Should we fail to meet our targets, it could undermine the progress made to date and ultimately impact our ability to save lives. As Humanitarian Coordinator my call to all of you, as government, as donors, as Member States, as operational partners, as members of the press and civil society, is to continue the outstanding work of recent years. I count on you for your continued support to the people of north-east Nigeria. Let us work together to save lives today and also restore stability to the region, end the crisis and save lives tomorrow.